This interview was originally published in the October 2016 issue of NewAfrican, pp. 86-88, to coincide with the fourth London edition of 1:54 Contemporary African Art Fair. In advance of the fair, 1:54 brought together three people deeply engaged in the art world to discuss the fair and the growing market for contemporary African art: Hussam Otaibi, Managing Partner of Floreat Group, the main sponsor of the fair and the Founder of Modern Forms, a collection and platform supporting contemporary art, Laetitia Catoir, Director at Blain|Southern and part of the Artistic Committee at 1:54, and Nick Hackworth, Director of Modern Forms. NH: Laetitia, perhaps you could start by telling us about how 1:54 got going? You helped found it I understand? LC: Yes, I became heavily involved with the inaugural year after Touria El Glaoui approached me to find out what I thought about the idea creating of a contemporary African art fair. Touria is connected to art through her family (her father is a renowned artist), but she didn’t have a background in the art business, so she had this great, fresh perspective on everything that was going on in the art world. I thought it was a great idea and we both felt the time was right given the lack of visibility around African art. That first year Koyo Kouoh and I helped as much as we could to get the fair off the ground but there was very little other support or understanding of what we were trying to do. We were running things on a shoestring. That first year we had 17 participating galleries, this year there are 40 galleries spread across three wings of Somerset House and the fair is now a fixture on Frieze week art calendar. NH: And so when was this? NH: And what was the response of the market when you were testing the waters? NH: Because of the danger of pigeonholing artists as ‘African’ rather than just been artists? LC: Yes, precisely, the continent is so diverse even discussing ‘African’ art can seem nonsensical, but what came out of our research at the time was the fact that in the main fairs the proportion of African art on view was just 0.05%! So as far as we were concerned there was need for the focus the fair provides. Also given the continent is made up of 54 countries – hence the title of the fair – there’s a huge diversity and variety of artistic practice to draw which wasn’t getting the recognition it deserves. NH: Hussam, as a collector and, through Floreat, the sponsor, what’s your take on this issue of having a fair defined by an identity like African? LC: Yes…that could be a danger but the fair is extremely lucky to have Koyo Kouoh on board who works across Africa, Europe and the US. Her work has seen her serve as advisor to the artistic director for dOCUMENTA and serve as a member of the Golden Lion Jury at the Venice Biennale, she has a rigorous approach. This means that the way we look at selection is to simply look for outstanding artists, not for any particular practice, message, or view. HO: That’s true, because if I think back to last year, I mean, yes, there were some artists whose identity seemed to be ‘African’, in their concerns at least, but most of the artists, just seemed to me to be good, contemporary, artists. LC: After going round the fair, in any year, you realise that there may be some common threads but they’re not what you’d expect them to be. What’s also interesting is seeing how the art scene has evolved in Africa over the last few years. I’ve just came back from Accra, Ghana where the lack of state funding means the scene is driven by private galleries, collectives and self-funded street art festivals. It’s a great example of how artists themselves are forging ahead. Elsewhere new galleries and museums are opening and private collectors are looking to open institutions in Nigeria, Côte d’Ivoire and South Africa, to name a few. There has been increase in artistic infrastructure on the continent at all levels. 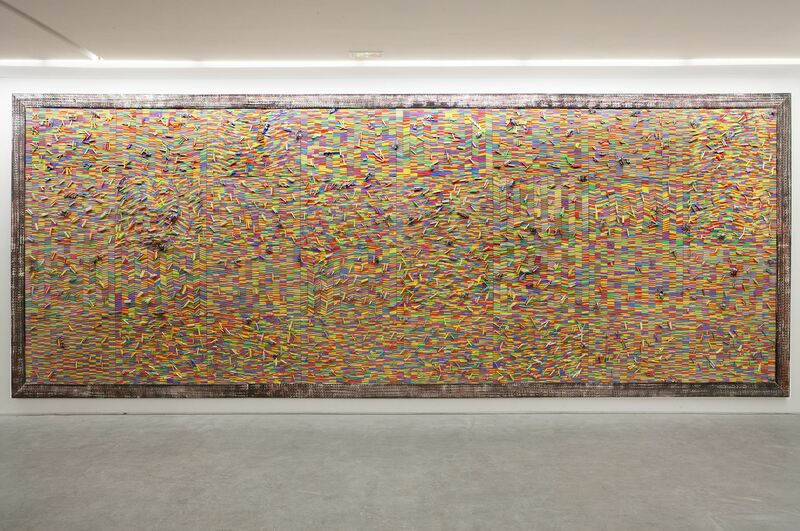 Internationally, the focus on contemporary African art has grown massively. Sotheby’s have recently launched an African Art department and African artists have big solo shows in leading contemporary galleries and museums across the globe; for example, next year contemporary African art will take centre stage at Fondation Louis Vuitton with an exhibition dedicated to 15 emerging artists from South Africa and exhibition of works from the Jean Pigozzi collection. African artists both at home and throughout the diaspora have increasing prominence and I think 1.54, along with general rise in interest in contemporary African art, both in Africa and outside has helped make that happen. It’s a very exciting time for contemporary African art. “Maybe the most common theme within my work, the physicality and also the process of the work is… the idea of labour and capital”. Young, Ghanaian artist, (b. 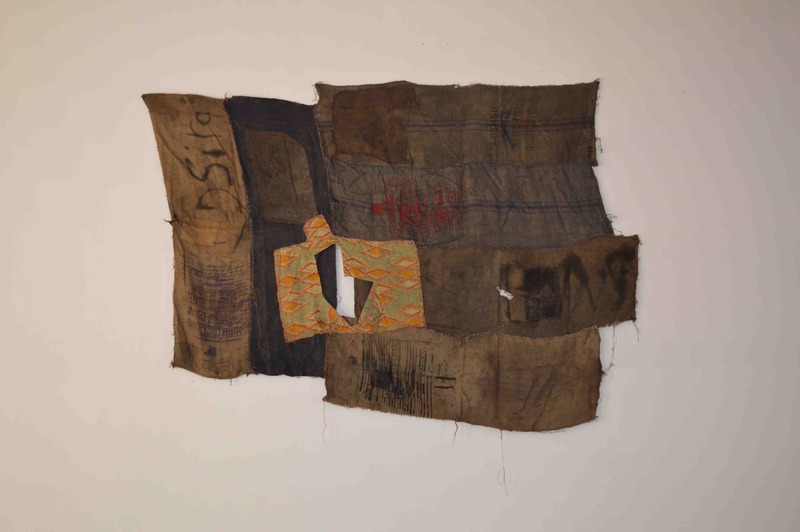 1987), Ibrahim Mahama, captured the attention of the art world with a series of astonishing, epic public art works he staged initially in Ghana and subsequently seen internationally including at the last Venice Biennale, where he covered buildings and public spaces with vast blankets of jute sacks and cloth bags sewn together. Manama found something poetic and structurally revealing in the typical life cycle of jute bags in his city. Originally manufactured to carry cocoa once, the bags would often be reused to carry food and finally coal. As the sacks circulated they would often become marked with names and numbers and sometimes embroidered or ornamented. Mahama explains that, “the coal sacks began as an extension of how the body could be looked at”. The physicality of the works, the marks, their history, make visible, tangentially, the world of material exchange and the many flows within it. Geneva based, Senegalese artist Omar Bar (b.1977) creates, dense, both visually and materially, painterly, works using a rich mix of oil, gouache and acrylic, typically onto corrugated cardboard. His visual universe is a confusing, often threatening and dark scramble of images; flags, fighters, logos, strange animals, thick vegetation and boldly and often singly depicted figures all compete on paintings’ crowded surfaces for attention. “I wouldn’t say I am an activist but I am interested in social issues. I see human suffering. People usually portray it under a political angle; I prefer to do so under a social angle.” Abdoulaye Konaté (b. 1953, Mali) has, since the 1990’s, when he stopped easel painting, used dyed, painted and embroidered textiles as his medium. 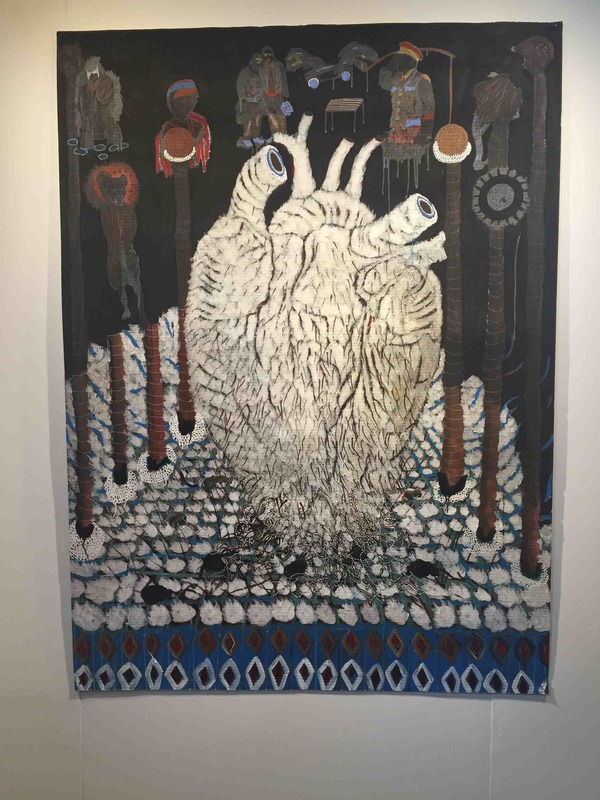 It was a development that drew on Konate’s deep engagement with Malian history and tradition, having worked at the National Museum of Mali for two decades – namely the importance of textiles as a medium of communication within West African culture. Critics have also referenced the Mandé – the Malian hunting tunic – as a symbolic influence on the form of his work. Whilst one strand of Konate’s work is abstract, another, of which Generation Biometrique no. 5 is a prime example, is figurative and directly political work. 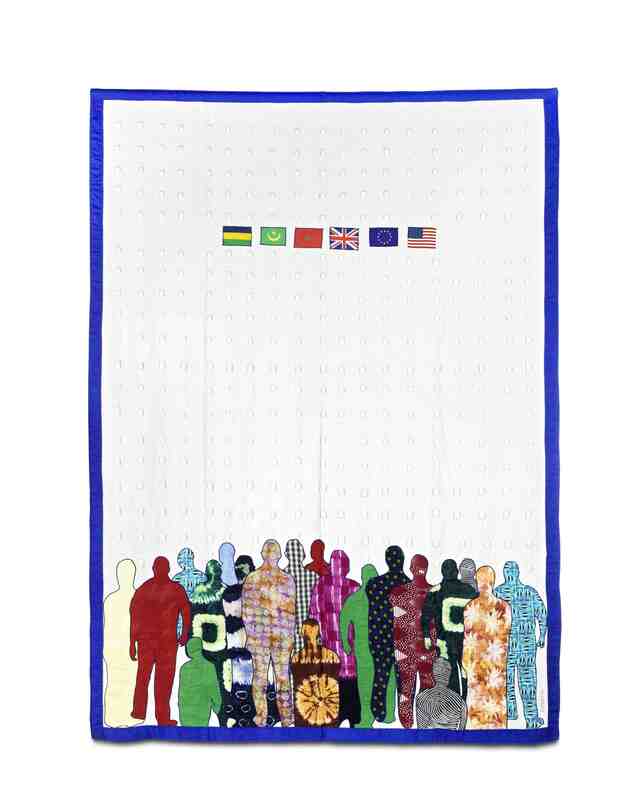 Finished in 2013 the work addresses the politics and power dynamics around the issue of immigration into Europe and the now standard biometric testing of all immigrants and the cataloguing of each person according to a standard set of metrics. “My work explores the theme of identity and what that means for me. 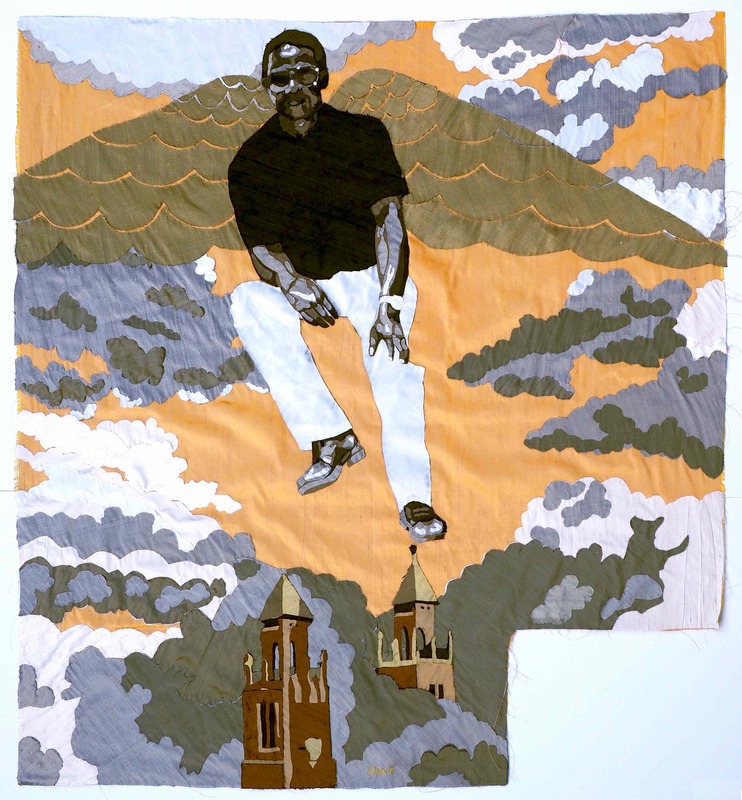 It is concerned with the female experience both personal and universal.” Born in 1973 in Blantyre, Malawi, raised in Botswana and now based in Johannesburg, Billie Zangewa creates beautiful, figurative tapestries and collages, typically in cut silk. A self-confessed ‘fashion fanatic’ from the age of 10, Zangewa studied printmaking and graphic design and, upon graduation, started making elaborately decorated handbags, that, over the time, became increasingly deconstructed till they emerged as tapestries. Zangewa explains the process of how each work begins: “I start off with an experience that elicits an emotion. The emotion then inspires an image that examines and narrates the experience.’ Describing her work as often autobiographical, her work centres around a powerful depiction of her identity, without being circumscribed by that as a subject. As anyone who saw Boomerang, his solo show at at the Serpentine own London last year, can testify, Pascale Martine Tayou’s art is bewildering, playful, frenetic, sprawling, absurd and serious by turns and uninterested in being easily defined. A lawyer by training Tayou (b. 1970 Cameroon), began making art in the 1990’s. He marked this transition in a very public and indicative act of self-redefinition, by feminizing his name, adding an ‘e’ to the end of Pascal and Martin. This ironic scrambling of received notions of identity embodied Tayou’s method of teasing out serious points from a playful and very personal perspective. Chalk Fresco is one of the largest of Tayou’s Chlak series, in which he fill frames with pieces of coloured chalk, creating vast, energetic, tactile, abstract surfaces. Tayou describes the series as an “act of revenge on a certain kind of education” in the sense that coloured chalks represented play, as against the white chalk of education and functionality, “it’s also a way of showing the origin of what I have become today”.